The opening of Pandora’s Box, which released the ‘evils of the world’ into existence, is perhaps one of the most well known of the Greek myths. However, much of the original meaning has been subject to cultural variations and scholarly interpretation. Myth is the language of the spirit, and a living reality in the present as long as we human beings are open to the romance and timeless profundity of life. Pandora was the first woman in Greek mythology, created by Zeus, fashioned with beauty by Aphrodite and adorned with wisdom and artistry by certain other gods on mount Olympus. She was also bestowed, according to the myth, with less flattering attributes such as deceitfulness and cunning to better her status in the affairs of men. Zeus, still brooding and angry with Prometheus for stealing the secret of fire, arranged for Pandora to be given as a gift to Epimetheus, brother of Prometheus. Although warned not to accept gifts from the gods, Epimetheus was delighted to receive her. After a while, curious of a box (apparently a large jar used for storage of grain and sometimes a human body prior for burial), Pandora removed the lid, thereby releasing the diabolical contents and although she hastened to close it again, it was too late. The box was empty except for one thing remaining at the bottom: Elpis, the deity of hope, which also means ‘suffering’ in older translations of the myth. The myths were created in the psyche in an era of human evolution when Man was in the process of becoming a self-conscious being. 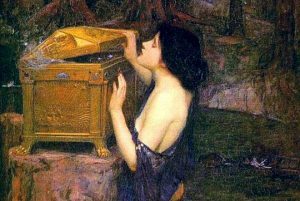 Pandora’s Box is symbolic of the body of mankind. In its pure state the box has nothing inside and is the purified space of love. It was not unlike the Arc of the Covenant, which was also emptied of any corruptive impurities. But as time and past began to build up in the psyche, blockages began to impede the flow of life. The pent-up psychic force reached a peak and penetrated the surface of the earth. This was the disease of time as an effect in existence which set in motion the long arduous descent into matter, and was the dawning of human nature. The myth of Pandora’s Box, like all the great myths, is demonstrable in our ordinary living experience. The release of the ‘evils of the world’ is a familiar experience whenever there is an emotional outburst such as anger, hate, accusation or cruelty. When this happens, the reactionary self is a conduit for the degenerative effects of the human condition of unhappiness. Pandora’s Box is the body, the container of the essence of life. In the mythic consciousness, Zeus and the other gods had yet to fully externalise as physical beings. They could enter existence in physical form but were able to withdraw at will to the formless inner reality behind the appearance of the world. Pandora has been largely misunderstood, just as Eve was blamed for the ills of mankind in the biblical myth of the Garden of Eden. Pandora is really the personification of love. It was ‘She’ in disguise, arising from the spirit of the earth, who valiantly unleashed the forces of existence to seemingly impose on humanity the most dreadful and heinous fate imaginable. But what must be endured as affliction and hardship is paradoxically the only way back for human beings to reclaim their original freedom. Until Pandora had opened the box, the state of immortal life had been the exclusive domain of the gods. The release of the evils of the world served to undermine the supremacy of the gods over mortal man. Thus was love the saviour of mankind. The deity of hope was the only remnant in the box. But is there any hope in this world where everybody dies? Obviously not. But it’s a precious piece of propaganda that the human race clings to as comfort and avoidance of facing life as it is. Hope is the last thing that disappears when all is known to be lost and death is inevitable. Strangely, or miraculously, in that moment all fear vanishes and what remains is love. To me, the older translation of the word Elpis as ‘suffering’ is more appropriate, because to transcend hope while in the midst of living involves enormous self-sacrifice. Nobody has ever found God or freedom without undergoing tremendous inner turmoil and upheaval in external circumstances. The spiritual task is to purify the inner space of the body through being emptied of negativity. Any moment when the unconscious force of self overwhelms the person, it releases the lid of Pandora’s box. Each of us is apportioned an individual box of karma, the past ignorance of humanity, to be faced as the difficulties in the living life. Suffering rightly is to have the knowledge of a higher purpose and to be willing to be disabused of the rational misconception of love and truth. The deeper the love of God, or the mystery of life, the more excruciating is the pain of detachment from the world. The highest truth demands the ultimate surrender, which Pandora in her wisdom knew would eventually triumph over adversity. This is brilliant do! So we’ll written. Thank you.